In new versions of Microsoft PowerPoint 2010 and 2013, you can create now presentation slides with motion backgrounds. Unlike of the versions 2000 and 2007 you can’t create a text above the videos or motion background. Now, thanks to the Microsoft Office, in this new version you have now to use motion background with text in the above. Talking with the motion backgrounds, there are many sites offered a free animated motion background of PPT, check this site: http://www.ignitemotion.com/ you can download right here any motion background you like in your stunning presentation. Open your PowerPoint in your computer. Once it open click home tab menu, then click layout, then select title only in drop down list. To insert videos or motion background, click insert tab menu. Then go to media ribbon bar then click video button. Then click video from file, select in the destination the motion background you downloaded previously, then click insert button below. Now the video is in your slide now, use the node, or the tiny box in both side and drag it to fill-in the entire slides. Click the motion background in the slide. Click Play, and click the tiny button called “show additional effects and options”. In the pop-up window called “Play Video” click click effect menu, then go to option after, then put number of slides in the bar. Next click timing menu, since you need the video to repeat until the slide will finish, go to repeat, then click drop down bar then select in the list, example 10. Then click ok button below. How to add text or a paragraph for your presentation above the videos. Right click above in your motion background. Then point to sent to back, then click sent to back. A bar will appear said “Click to add title”, type it there your text or paragraph. Highlight the paragraph or text. Then in pop up window select, example shadow. Use the sliding bar to adjust the properties of the text or paragraph. How to apply playback for the motion of the video into the slide. Click the video in your slide. Then click Playback tab menu. Check box loop until stop. Click drop down bar called start, then select automatically. How to add another paragraph in the same slide with motion background. Then hold control then press C. You are going to copy the first paragraph. Since all of your paragraph will play in the same slides. Like for example a lyrics of a song. Then drag that paragraph into the top of your first paragraph. For another paragraph or stanza or a chorus of a song, repeat the procedure 2 and 3. Use control then click of the mouse to select. How to apply animations of your paragraph or in the stanza of the lyrics of the song. Highlight the paragraph or the songs. Use control then press A. It will highlight all including the motion background. But you need only the paragraph for the animations. So use control then click of the mouse outside of the paragraph. Now your ready for the animation, click animation tab menu, then click add animation button. Then select animations under of the entrance. Example fade. Then click animation pane, it will show a task manager in the right side of your slide. Since you need a starting effects in your paragraph, right click on the title 1 then click start on click. Since you need an exit animation effects, click add animation again, then click fade under of the exit. Now look in your animation pane task manager, then you will see a green star as your starting animation and red star as your exit animation. Since you have entrance animation as a start on click, you need also a start on the previous, so just right click in the title 1 of the red star. Then click start with previous. Now the text needs to feeds in then another text to feeds out, so you need to drag in the title 1 as your exit animation to the second line of the entrance animation. So click the title 1 in your exit animation, then drag into the second line of your entrance animation. Since you need to start on click in the last feed, you need to right click the last line of your exit animation, then click start on click. You need to install Microsoft Office 2010 to run this application with windows 7 compatible. You need ample experience using the PowerPoint latest versions, so that you can create this application. There is also one way how to increase quality and visual effect of our presentation. I'm talking about the Power Point Templates, there are a lot of free to use and for few dollars' payment great Power Point Templates. Or maybe you want to try some templates of diagrams and maps try this web there are more than 40 thousand different Power Point Templates. Nice Ray, this PowerPoint presentation is really cool, you can use only a high version of PPT like 2010 version. 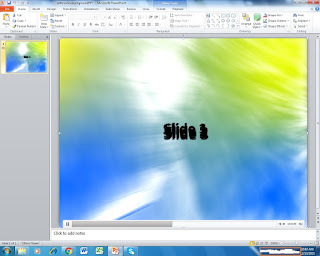 This is a presentation using the motion background like in this link: http://www.poweredtemplate.com, kindly share your ideas in using this application of ppt. Its a great help with us and the reader of this site. Thank you for your visit with us.